Antique original swords and sabres for sale. Rare Austrian, Prussian, Hungarian and Polish weapons. Genuine European and Oriental swords. Luxury sabre of a Hungarian magnate (Hungarian Lord) with scabbard. Probably end of 18th or beginning of 19th century. Handle: black wood, silvered guard. Luxury Custom made Hungarian sabre sword: damascus blade, rich decorations, widened blade, decorated handle made of horn instead of leather. The sabre belonged to a Hungarian cavalry officer or a noble (Hungarian magnate). The basic 1811 sabre model was tuned to perfection. No scabbard. Sabre length: 34.3" Blade: 29.5" Blade width: 1.457". Authentic elite Hungarian sabre from early 19th century. Authentic hussar sabre sword. 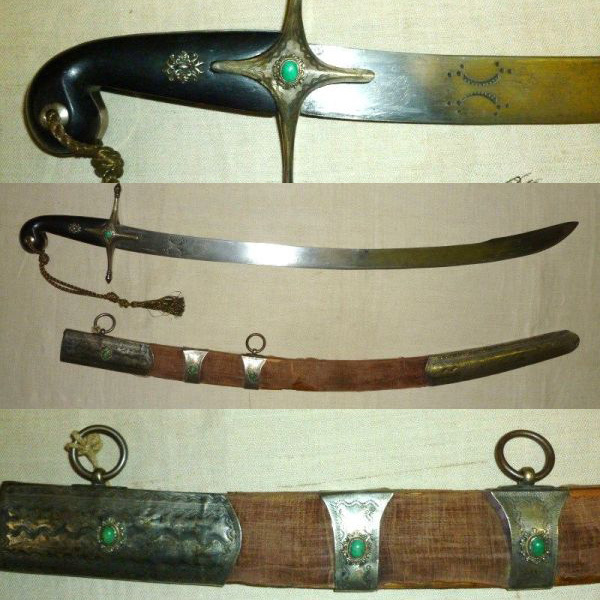 Luxury sabre of the legendary cavalry troops. Origin: 1750+, probably Austrian hussar regiment. Decorations: Bust of Turk, occult kabala symbols on blade. Ray skin handle. Decorateed guard. No scabbard. Authentic hunting sabre from beginning of 18th century (1700+). Area of use: Eastern Prussia, Greater Poland, Russia. Antique Talwar Sword from Afghanistan. Authentic talwar 19th century. Original Afghan talwar (pulwar) sword with scabbard. Antique French Briquet Sabre AN IX. Authentic briquet sabre sword, probably Zouave troops. 37.2 inches. Original scabbard. Authentic Austrian Cavalry Sabre 1869 Damascene blade. Custom made sabre sword from 19th century. Original, authentic sabre sword from Austria-Hungary. Antique Austrian Officer Sabre 1869. Original authentic sabre sword from 19th century. Scabbard. 34.3 inches. Antique Imperial Court Sword 18th Century. Authentic, rare sword from early 18th century. Imperial apple, dove. Sword of infantry officer. Central Europe. Antique Prussian Officer Rapier Sword 19th Century. True sword from historical Europe. Rapier sword of Prussian infantry officers. End of 19th century. W.Glauberg, Solingen. Antique Rapier Sword-Austrian Railways 1857. Authentic rapier made for officers of Austro-Hungarian railways. Floral motives. Weyersberg & Stamm, Solingen. Antique Austrian Sword 1824. Authentic Austria-Hungary sword from 19th century. Manufacturer: Fischer. These authentic swords come from Europe. Each sword comes with a certificate of origin with a description and history signed by a museum expert.